Readers, before I was a thirty-something dork obsessed with tailoring, I was a young dork obsessed with unicorns. In fact, one of my first independent sewing projects was a felt unicorn throw pillow, made in Home Economics. My mother is a fellow crafty person, and she indulged this love of magical horned ponies by knitting the sweater you see above. If you're a knitter, you'll know that a unicorn sweater is no small feat—it's a triumph of intarsia! Anyway, my mom and I were talking about THE SWEATER! yesterday. I just so happen to have a work function this week for which I need a unicorn-themed costume. (Long story. Let's just say I'm still Team Unicorn.) Well, Mom still has THE SWEATER! around; she refers to it as "her masterpiece," for obvious reasons. Do you see where this story is going, readers? The unicorn sweater is on its way back to me! And I'm going to attempt to squeeze into it! I'm so psyched. Now I just need to get to work on making a sparkly horn and coordinating the rest of my ensemble. Back when the sweater was first made, I used wear it to school with the cutest matching purple corduroy skirt. (Yeah, I was so stylin'.) I'll have to see what I have in my wardrobe now that will do it the same justice. Now, before you lambaste my young personal style, remember that this was during the heyday of Lisa Frank paraphenalia. I have to say, I still get a little giddy when I see Lisa Frank stuff. Ah, memories. I'm not really sure what this post has to do with sewing, but there you have it. GO TEAM UNICORN!!!! When I was in second grade, a class project was to create an educational poster about an animal, and then give a short talk presenting your poster to the class--where your animal lived, what it liked to eat, that kind of thing. I chose...the unicorn. And produced a poster, complete with citations from a bestiary (bless my then-librarian mother), all about the unicorn's natural habitat and migration patterns. I think this anecdote alone is a pretty perfect summary of just how dorky a little kid I was. I was oddly enough just thinking about Lisa Frank stuff the other day... I forget what prompted it, but I was musing over how in love I was with all the brightly colored illustrations! That merchandise was such a hot commodity among my middle school-age pals. ;) lol. Oh, you look so sweet and happy! I hope it'll fit you! I don't know Lisa Frank (I'm from Australia, mate) but I do know that My Little Pony has a unicorn one. Love that jumper, make another purple skirt! And we want photos. I can't believe you found that picture! I still love that sweater and I don't care what anyone says - you were not dorky - you were adorable. Only a mother can say that! The sweater will be on its way this morning! Awesome sweater! I managed to find somewhere selling the pattern (it's in #517, Kids Knits http://www.buggsbooks.com/patons.html) Yes, I am a knitting dork..
Gertie, don't hate me, but I must instruct your readers that they supersize that unicorn sweater pic by clicking on it. And enlarge it further by clicking on THAT (at least on my computer). Still not big enough for me -- I want poster-size -- but better for close viewing of details. A work of art! My little girl has a unicorn fetish too! She draws them all the time and will probably cry when she see's your jumper, or at least demand I make one! SO AWESOME. I can't wait to see what you do with it. I have a unicorn story you might appreciate. So I too, am of the Lisa Frank trapper keeper with neon hearts and unicorns era and when I was in second grade my best friend Tricia, and I had matching ambitions to grow up and get Unicorns for y'know general unicorning purposes. When adults would ask what we wanted to be when we grew up, we'd always reply with "A Unicorn" in awesome kid deadpan to see what they would say. I will say that I loved them, but she LOVED them. Anyway, the following year she went to different school due to rezoning and we fell out of touch. Seven years later and we met up again in history class on the first day of high school. My last name is Byrd and hers is Caldwell so of course we were seated next to each other. We were happy to see each other, but I had grown into a trash-talking pink-haired obnoxious faux punk and she was a raging band nerd with clarinet tshirts blazing so yeah, we didn't have much in common. Anyway, after about a month of classes we got comfortable talking again (meaning I got over my badass self) and asked her, hey remember when we were kids and we'd tell people we were going to be unicorns when we grew up? and she looked straight at me, and replied, "Actually, I still am planning on that". talkin' bout my generation. We must be the same age...I too was obsessed with unicorns (didn't Rainbow Brite ride one? Wasn't there a My Little Pony unicorn or two). That sweater is indeed a work of art. What a feat! You were so adorable! And your sweater so cute. How neat that you were able to dig up that photo. Rainbow Bright's horse, Starlight, wasn't a unicorn but did have a gold star on his head. She-Ra's horse, Swift Wind, had a unicorn horn (but not when she was untransformed, plain ol' Adora). I was never sure if it was a real unicorn, however, as on the toy the horn was just a part of the bridle. I was Team Dragon, personally (is there a Team Dragon? I hope so) but I did make a lovely filet-crochet of a unicorn during high-school. If I can find it I'll take a picture. Good ol' Lisa Frank. I could never decide if I liked her stuff better, or all that strawberry-scented Sanrio junk ... can't wait to see you in THE SWEATER! I preferred my equids hornless (My Little Pony, and then Breyers, which are a whole other hobby world unto themselves), but, buy, do I remember Lisa Frank! Somewhere, in boxes of old clothes I have a lilac unicorn sweater, too... only it's a RTW unicorn print. My sister wore it, too. And I had lots of the Lisa Frank stuff, I still have a trapper keeper around in boxes of school supplies with a unicorn scene on it, and there's a unicorn blanket wadded up at the foot of my bed right now. (It's warm!) So, Gertie, you're not alone. I think it's the age bracket. All of us girls growing up in the 80s and 90s had unicorn obsessions, partially brought on by mass marketing. Unicorns were everywhere for a while there! Ah, Lisa Frank. I had a bunch of her stuff. And remember the Sophistocats? I had a Sophistocats Trapperkeeper with a big Siamese cat on it. That stuff is probably due for a hipster-ironic come back. Ahead of your time--check out the sweater on pp.28-29 in the Twinkle Sews book. I REALLY hope there will be a gold-horned, unicorned sweater, superbly styled photo in our near future! :) I love THE sweater! If I had gone to school with you, I would have been so jealous! I was just telling someone the other day how I would like to have my own unicorn. Of course I also come from the Lisa Frank era.Can your mom make me one? that sweater is amazing and you should wear it every day with pride ! Oh you're adorable! I love dorks and young dorks in particular. I'd forgotten how...loud Lisa Frank was, and yet I can clearly remember the feeling of desperately wanting some folders with her designs on them but knowing that my mom would say that the plain ones work just as well. Hey, I think I still have that poster in the basement. And the jewelry. I think I've managed to purge most of the 80s fashions. It's kind of comforting to know that a style maven like you was once as dorky as I was. This is soo funny! But I can't say I wasn't also obsessed with Lisa Frank though too. I still have my sticker book collection. It's a hit when I babysit my sister's girls. I love unicorns in an ironic way. But secretly really love them. So much that I have been a unicorn twice for halloween. Who can resist dressing up as a magical creature? My Unicorn Costumes!!! I think I would be a unicorn again... except that my friend is using the headpiece for a my little pony costume. Oh my goodness. You need to play Robot Unicorn Attack! Set to the sweet 90s gem "Always" by Erasure. I wonder if Lisa frank is making a comeback? I just saw something if hers last week and I was all nostalgic for a bit. Enjoy "the sweater" part 2! Wow, I haven't thought about Lisa Frank in a long time! When we purchased school supplies for grade school, my mom would only let me choose one Lisa Frank folder because they were so much more expensive than the plain colored ones. So I had to decide which subject was special enough for that folder. I love the sweater -- that is some impressive work by your mom!! I had everything in Lisa Frank. Oh man. Backpack, folders, binder. I even had pencils and erasers. I enjoyed the unicorns, but found that I gravitated more towards the Lisa Frank horses. Ah, Lisa Frank. My mom still has my sticker album, organized by category, with a whole section devoted to unicorns. I spent all my allowance on stickers... And now I spend it on fabric. So, yes, still a dork. But it is a beautiful sweater! I love the sweater and photo so much I can't stop looking at it. Adorable most! ^^^please look at this page (especially toward the bottom). you will die. i wish your mom would knit me THE SWEATER! because apparently I am still a dorky unicorn lover. Love the sweater...and I've loved Unicorns since I was a young girl. Must be the artistic nature of us sewists to love this mythical creature!! Lisa Frank...my daughter couldn't get enough of those items as a young teenager as well. Funny...one year for Halloween I sewed up a purple satin unicorn outfit with a silver/gold lame unicorn horn for her to wear...I must dig that picture up and post it. Thanks for stirring some beautiful memories. I hope you can fit into it. If I'd knit my little girl a sweater like that I'd have kept it too! One of my friends appliques T-shirts and donates the money to a charity, and I custom ordered a unicorn shirt. I even added that I wanted the horn and tail to be rainbow. So I'm a 20 year old dork, but it's great! Well, I'm (much) older than you, so missed this fad - but I think your mom's sweater is much nicer than the commercial pictures. My daughter (now nearly 13) loved "my little pony" when she was little, but has moved on. Now she likes "Charlie the Unicorn"...(google, if you don't know)... Fun posting! I'm looking forward to seeing you recreate the original photo. Hand knits are very stretchy and 80's styles were so over-sized, the sweater will probably fit just fine. I have always belonged to Team Unicorn. Go Team Unicorn! I was (and still am) a My Little Pony fangirl myself, but I can still appreciate a good love of all things unicorny. That sweater is AMAZING. Your mom is so awesome. :) This post is especially meaningful to me today as I toil away on costumes for a fancy Egyptian mummy, a dryad, and a ballerina. I feel a kinship with the Crafty Moms of the World. Rainbows and Unicorns! And sneaker roller skates! (Wheelies - pfft!) These are the things my pre-teen years were made of ("tweens" - pfft!). I had my unicorn spiral notebook, filled with unicorn drawings (that I made while wearing my sparkle rainbow t-shirt), but I was soooo jealous of a friend from school. She had a rainbow unicorn MURAL in her bedroom. Painted by a professional artist. Filling one entire wall (the unicorn was practically life-sized). This was 1982 - WAY before the Mural in Every Child's Room movement. My specialty was actually the extremely rare Unicorn Pegasus, Flying Past Rainbow. A horn AND wings?!? Oh, yeah. OMG, I knit two of those sweaters for my girls, one pink background, the other lavender. You looked adorable in yours! I am/was a unicorn lover as well. Had a bunch of breakable type things all over my room of unicorns. I wanted one so bad as a kid! Love the sweater - that is just amazing. 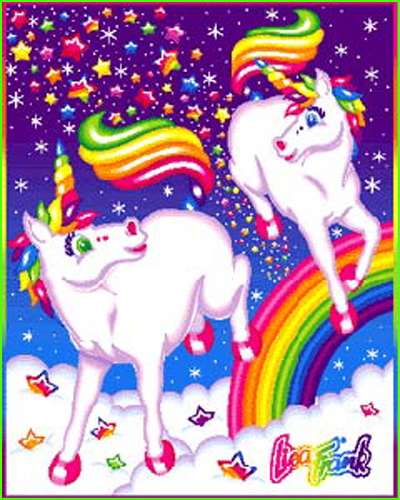 I also remember Lisa Frank and have not thought of that stuff in years - thanks for the trip down memory lane. This post made my evening as A.) the unicorn was and is my favorite mythical creature B.) I am a knitter and C.) hello its a unicorn sweater....awesome. You are really talented. Best of luck to you and your sewing endeavors. I'm not shame to ask if you would check out my new book, "50 Ways To Make Money Sewing." Maybe this book can help add to your already successful sewing career. Take care and best to you.